The article is dedicated to the sociological problem of designing images of the future social reality, which is characterized by features of singularity. The specifics of the present stage of the development of society are considered, connected with the prolonged stay of the public consciousness in anticipation of cardinal positive changes, the dynamics of transformations, the need for a new model of social development that evolves in the conditions of unpredictability. 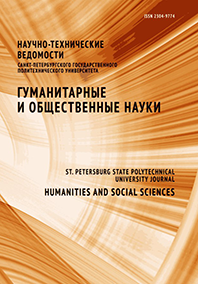 The approach to the treatment of singularity is analyzed in the article, its types are described with reference to social phenomena and processes reflected in the public consciousness in the signs of contradiction, protracted stay in a mobilized state, and search for an ideological platform. The essence of the singular social reality is revealed in the context of co-evolution of nature and society in the conditions of rapid technological shifts. it is noted that a long borderline existence at the limit as a characteristic state of society is associated with a change in the role of the information sphere, enthusiasm for game practices. singularity in the social world means the process of producing unpredictable meanings, the existence and development of the social system, the subject's consciousness in the interval of inaccurate data, development in logic governed by nonsense. singularities signal a failure in the social order, in the routines of life based on conventional reality. They mean the state of the society in which the mechanism of producing new values is launched, which generates vulnerabilities and phantom phenomena. This creates a pervasive sense of impotence before the future, the uncertainty of the forthcoming, free flow without adequate intervention. a sociological analysis of the opinions of representatives of various social groups reveals a request for a positive image of the future and the identification of the driving forces of its construction. The main driver of development in the future scenarios is formed on the basis of the potential of each individual person and their involvement in the technological and innovative economy. The materials of the article can be used for projective research, development of models and scenarios of the future social system and its elements, determination of the driving forces of innovative development.